THE COW SHOW: It's DAY-ta. Not DAH-ta. Five months ago in a po-tay-toe-po-taaaa-to blog, I discussed a couple of words and their proper pronunciations. I've got another one that has been grinding my gears as of late, and as you have probably guessed by the title of this post, it is our friend "data." Let's take a look at the definition. The term data means groups of information that represent the qualitative or quantitative attributes of a variable or set of variables. Data (plural of datum, which is seldom used) are typically the results of measurements and can be the basis of graphs, images, or observations of a set of variables. (wiki). Now let's see what the pronouciation sounds like. The word data (pronounced DAY-ta or DAH-ta) is the Latin plural of datum, neuter past participle of dare, "to give", hence "something given". In discussions of problems in geometry, mathematics, engineering, and so on, the terms givens and data are used interchangeably. Also, data is a representation of a fact, figure, and idea. Such usage is the origin of data as a concept in computer science: data are numbers, words, images, etc., accepted as they stand. (wiki). Yeah I got this error message and now nothing will work. Ok, well let's make a backup of your current DAY-ta and then we'll run a few fixes to take care of that for you. Well do you think my DAH-ta is going to be fixable? Yes, but first, just in case, we want to make a backup of your DAY-ta. Click on file and then backup DAY-ta. Ok, so file, then what again? Backup DAH-ta? Yes, backup DAY-ta. ::presses mute button:: FUCKKKK! 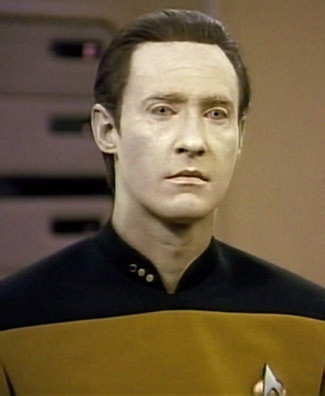 I'm not a Star Trek dork, even though I might become one if they keep churning out awesome movies like the latest one was, but I always think of the robot with the yellow shirt, who happens to be named Data, and says it the same way I do. I haven't been able to find any reason or geographic location that draws a line between the different ways to say it. In general, I would argue most IT people pronounce it DAH-ta. Who knows. By English standards, if a syllable ends in a vowel, then the vowel is pronounced long. If a syllable ends with a consonant, the vowel is short. Also, if you want to get tricky with it and toss in a suffix for good measure, the consonant is doubled. An example of this would be "shitter." Used in a sentence would be "Hey, go check out that monster turd in the third shitter!" I suppose the argument for calling it DAH-ta derives from the origin of the word, which is Latin. Since the plural of data is datum, which is pronounced DAH-tum, this has led to people calling DAY-ta DAH-ta. However, I will end this argument with the fact that datum is never used, and as such, neither should DAH-ta.